Need a functional yet stylish stand for your Apple Watch with a throwback flare? The Elago W3 may be just what you're looking for. Going for $15 on Amazon, this stand's look is self-explanatory - it's a miniature Macintosh computer, a classic Apple design. Your Apple Watch screen turns into the monitor's display, only a very tiny one. 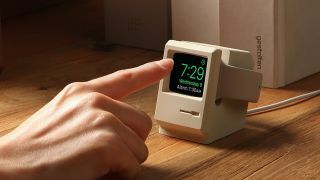 The Elago W3 supports both the first Apple Watch and Apple Watch 2, and is compatible with the smartwatch's Nightstand mode, serving as a bed-side alarm clock while turned on its side. Made of scratch-free silicon, the Elago W3 looks like a comfy, safe home for a pricey Apple Watch to rest its head while powering up. You can also pick one up through Elago's website . Let's face it, this may be the cheapest addition to your Apple device collection.